Beef Stew is easy to make with tender fall apart beef and hearty vegetables. It is super flavorful, rich, and PERFECT for cold days. A full and delicious meal that the entire family will love. Nothing can be better than a bowl of homemade beef stew during winter time. This dish is a staple in our house, and we make it quite often during this time of the year. If you enjoy comfort food, then this is a must try! You might also love our delicious Shrimp Creole, Cheeseburger Soup, or Chicken Noodle Soup. 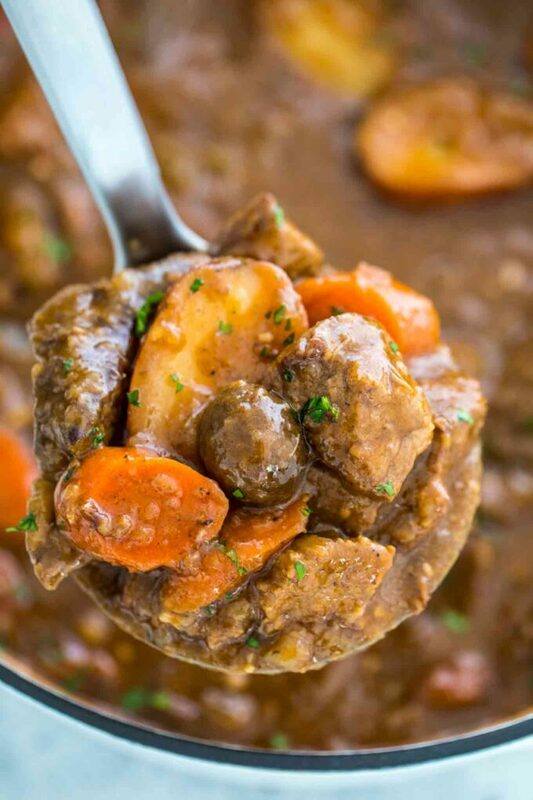 A classic beef stew is a combination of chunks of meat, vegetables, broth, wine, garlic, and seasonings. It is filled with the most amazing aromas and rich flavors. The nice thing about this stew is that it’s easily customizable, as you can play with ingredients to fit your taste. Feel free to substitute with your favorite veggies, or even add leftover roasted potatoes, or mushrooms. For bacon lovers, just chop some up, brown it, and throw into the stew. This homemade recipe is also great to make ahead and store for days to come. The aroma will absorb into it as it sits, and will taste even better in the days to come. 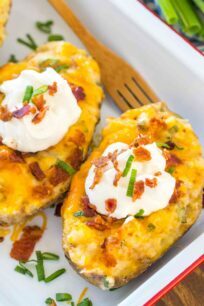 Serve it as is, or with some warm baguette or over homemade mashed potatoes for the perfect finish! 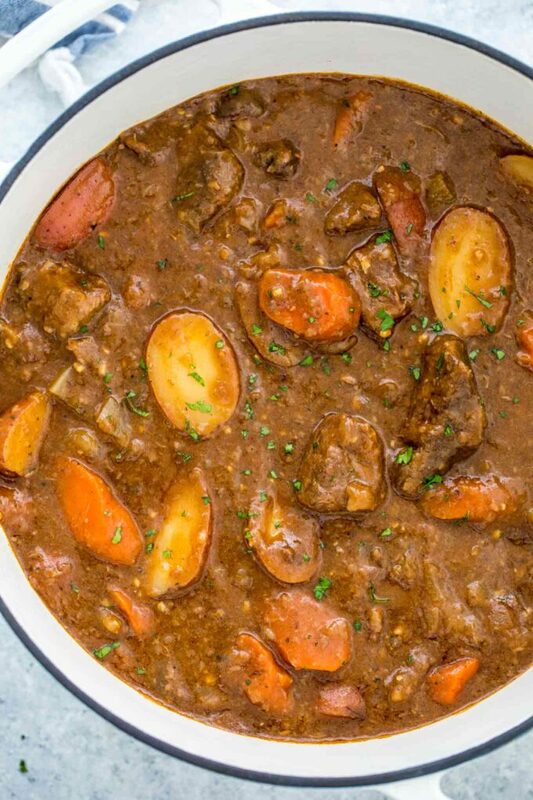 What is the secret to a perfect beef stew? The secret to a perfect stew starts with meat. You always want to use the best meat which is well-marbled. This way when you cook it, it is perfectly juicy and tender. In addition, it is important to brown your meat before adding it to the stew. 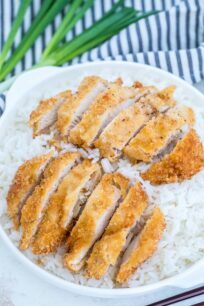 It makes such a difference in the flavor as it adds a nice caramelization to it, and also a perfect color which looks very appealing. Similarly, you want to use broth instead of water, as this will intensify the flavors and give the dish a rich and delicious aroma. Lastly, you want to give this dish some time to cook and not rush it. Not cooking the stew long enough might result in tougher meat, which you want to avoid. Follow this tip: for really juicy and tender meat, cook it low and slow, for approximately two hours. 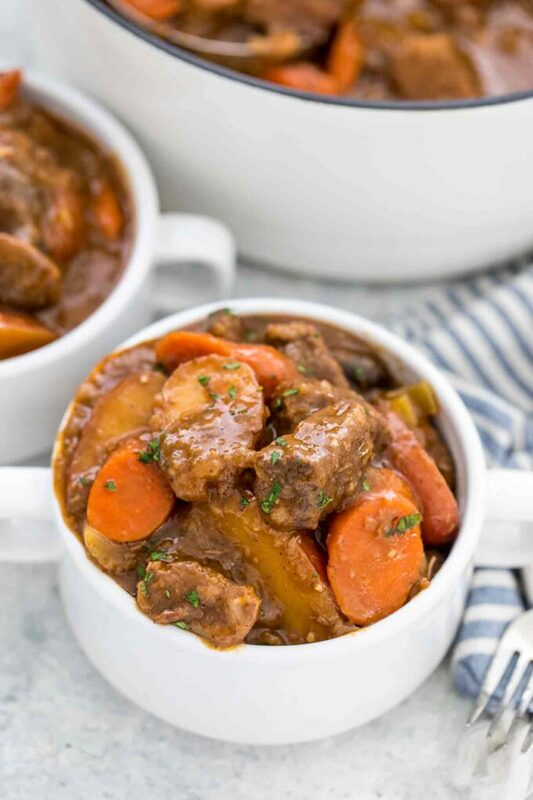 How to thicken up beef stew? Flour/butter method – You can mix an equal amount of flour/butter together (about 1 tablespoon), and add it to the dish during the last hour of cooking. Make sure it is well mixed together before pouring into the dish. Cornstarch Slurry method – It is similar to using the flour method, and what we do most of the time. Use 1 tablespoon cornstarch mixed with 1 tablespoon cold water for each cup of medium-thick sauce. Make sure to mix it well before pouring into the sauce. Then, pour the mixture little by little into the bubbling sauce/stew to thicken it up, until the desired texture is reached. Once thickened, allow it to boil for at least another 2 minutes. Puree the vegetable method – Using this method, you simply remove about half of the vegetables from the pot by using a slotted spoon. Then, give the vegetables a quick mash or place in a food processor. Add 2 cups of stock to the vegetables and puree them. Lastly, add the mixture back into the stew and bring it back to simmer. Make sure you DO NOT puree ALL of the vegetables as it will have a very thick consistency. Absolutely! 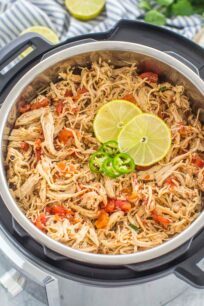 Making this delicious homemade dish in the Instant Pot is easy and delicious. Also, it will be done in a fraction of the time compared to the traditional stovetop or slow cooker version. We have already made it in the Pressure Cooker, the recipe can be found here. Which cut of beef is best for stew? Generally, you can find in store pre-cut cubbed beef meat for stew. It is usually chuck or round, as they tend to be tougher cuts but become tender and flavorful when slowly simmered and cooked in liquid. This is the perfect dish to make ahead of time and store because the flavors and aromas will get richer and better as it sits. Make it 1-2 days in advance, and simply refrigerate it. Then, just reheat in the stovetop or microwave until warm. Absolutely! Simply transfer the dish into an airtight container and freeze it for up to 3 months. Another great idea is to freeze it in individual freezer bags so you can reheat in single serving portions. When ready to eat, defrost overnight in the fridge then heat it up until warm. Always brown the meat it will make a huge difference. Cut it into 2-3 inch sizes, and brown on both sides. For bacon lovers, chop some up, brown it, and throw into the dish. Just don’t over do it, or the stew base will be greasy. You can omit the wine if you are not a fan. However, using wine helps develop richer and more complex flavors in this dish. Similarly, you can make this recipe with other meats. Use the same steps in the recipe as a base, then replace it with your preferred meats, such as pork, lamb, or chicken. Serve it with bread, biscuit or French baguette. 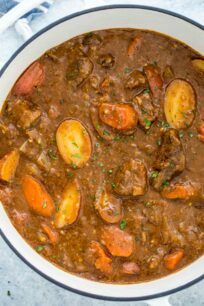 Beef Stew is easy to make with tender fall apart beef and hearty vegetables. It is super flavorful, rich, and PERFECT for cold days. Add beef chunks to a large bowl, and sprinkle with flour, salt, and black pepper. Toss to combine. Add a heavy-duty, oven safe large pot or Dutch oven over medium-high heat and add 2 tablespoons of oil. Once the oil is hot, add the beef a few pieces at a time into one layer, making sure to not overcrowd the pieces. Brown, turning the pieces on all sides, for about 5 minutes per batch. Remove from pot and transfer to a plate, cover with foil. Add another 2 tablespoons of oil to the pot and cook another batch of beef. Once done cooking the beef, reduce the heat to medium and add the wine to deglaze the pot. Use a wooden spoon to scrape well the bits that stuck to the bottom of the pot. Add two tablespoons of butter and melt it. Add the diced onion and minced garlic, stir and cook for 1 minute. Add Worcestershire sauce and tomato paste, stir to combine. Add 4 cups of beef broth and stir. Add back beef chucks. Add the quartered onion, whole garlic cloves, bay leaves and fresh bunch of thyme. Cover and cook on low heat, skimming broth from time to time, until the beef is tender, for about 1 1/2 hours. Discard the thyme and bay leaves. Add the carrots, celery, mushrooms, and potatoes. Stir to combine. Cover and cook in the preheated oven for about 1 hour, or until the veggies are tender. If needed, add broth or water if the stew is dry. Remove the stew from oven, taste and adjust for salt and pepper. If you prefer the stew to be thicker, check the posts for tips. We like to add a cornstarch and water slurry to thicken it. Stir and boil it for 2 minutes. Serve the stew warm, garnished with freshly chopped parsley. In step#2, don’t you mean cover with foil instead of “oil”? Hi Greg, thank you for stopping by. Yes, thank you for noticing I have corrected it. Hope you have enjoyed it!